18 hours. 8 miles. 36 more hours. Eighteen hours passed between the time my daughter's birth mom called to tell me contractions had started and the moment I held our daughter for the first time. We were only 8 miles away from the hospital. Plenty of time to get there and be with Crystal, the woman who was about to make me a mom. Another 36 hours passed from the moment Tessa was born until the time we all left the hospital to take her first to Crystal's home and then to our own. Because we lived in the same metro-area that Crystal did, our open adoption began locally and we did not to not have to travel during this time of heightened uncertainty and stress. Not so for all families formed by adoption. Some must travel far from home for the birth and early days of parenting. Such times can be full of uncertainties. Emotionally-charged relationships are being formed. Hormone levels are high. People are navigating uncharted territory as they define their roles in relation to each other. There are the highest of highs and the lowest of lows, all within the same general place and time. What could happen? What will happen? How long will it all take to happen? People who travel to adopt may not have certainty at the hospital, but they can have certainty at Residence Inn during their stay. Residence Inn is known for being a reliably comfortable place to make yourself at home. "Residence Inn is committed to finding new ways to support families and enhance their overall travel experience," says Diane Mayer, vice president and global brand manager as she speaks of Residence Inn's its commitment to the LGBT community and family travel. "This opportunity will provide access to expert resources, and prompt dialogue in the LGBT community, which is important as we continue to engage with and welcome our guests," says Mayer. With more than 600 properties in the United States, Canada, Europe, the Middle East and Central America, Residence Inn by Marriott is the leader in the extended-stay lodging segment. Designed for long stays, the brand offers spacious suites with separate living and sleeping areas. Fully functional kitchens, grocery delivery, 24-hour markets and complimentary breakfast help guests maintain a healthy balance while on the road. Complimentary Wi-Fi allows guests to stay connected to the home and office, while health and fitness options and inviting lobby spaces provide comfortable places to work and relax. Sounds like a home away from home. Exactly what's called for during the early days of parenting. In the meantime, visit TravelingMom.com for more tips about traveling with a baby and as a family. 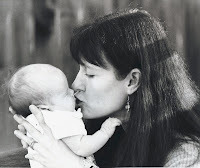 Disclosure: Thanks to Residence Inn for sponsoring this post -- in which you all get to reminisce with me about the day I became a mom --and for sponsoring the weekly #TMOM Twitter Party on November 6. Lori blogs at LavenderLuz.com. 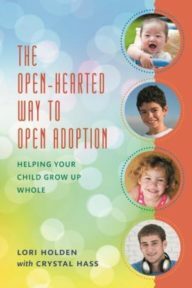 Her book, The Open-Hearted Way to Open Adoption, was written with her daughter's birth mom, Crystal, and is an acclaimed and helpful guide for all families embarking on the adoption journey. Check out the reviews!